This year’s Alton Lions Easter ‘Eggstravaganza’ has resulted in a £1250 donation to Bushy Leaze Early Years Centre that will be used to buy digital cameras, remote controlled toys and building equipment to be used to help develop hand-eye coordination in the children. 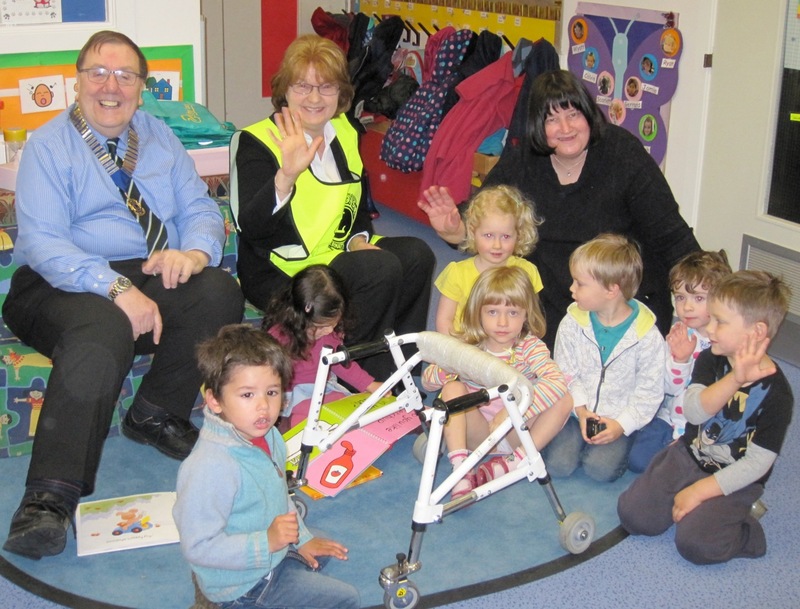 Pictured are Alton Lions President Peter Bacon with Lion Janis Chandler, Teacher Wendy Taylor and Bushy Leaze children and President Peter receiving tips on cake making from Bushy Leaze children. The Centre provides a nursery with 60 children, with fifty per cent of the places designated to children with learning difficulties and disabilities. Bushy Leaze also supports some 500 other children from the local area and operates a baby clinic. Wendy expressed her thanks to the Lions for organising the project and said it was very encouraging to know that there was so much goodwill in the local community for Bush Leaze. President Peter also thanked the local businesses in the area including Alton Golf Club, The Kings Head, The Wheatsheaf, Charwell House, Alton College, The Eight Bells & Bushy Leaze from Alton; The Star Inn at Bentworth; The Greyfriar in Chawton; The Three Horseshoes & Worldham Golf Club in East Worldham; The Rose & Crown & The Golden Pheasant at Faringdon; The Windmill Inn at Four Marks; Kingsley Golf Club, Kingsley Tennis Centre & The Cricketers Inn at Kingsley; Avenue Nurseries & The Royal Oak in Lasham; The Castle of Comfort in Medstead and The Courtyard Village Shop in Ropley without whose support the project would not be possible.